The word "tisane" is not a familiar part of American lexicon, but you've probably been drinking them throughout your life. A tisane is simply a cup of "tea" made from something other than a tea leaf. 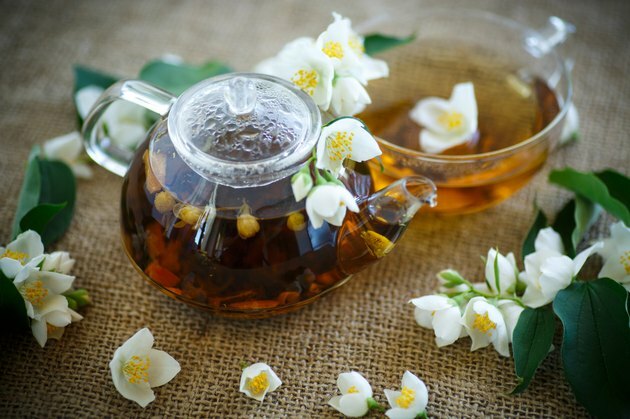 True tea comes from the Camellia sinensis plant, and it is sold in stores as white, green, black or oolong tea. Herbal, floral and fruit teas are actually considered tisanes. Tisanes are mostly chosen for flavor variety or to avoid the caffeine in the tea leaf, but some herbs have medicinal properties that are best absorbed in tea form. True tea contains varying amounts of caffeine -- less than a cup of coffee, but still too much for those who are caffeine-sensitive. Herbal teas, or tisanes, are popular alternatives because many are caffeine-free, and some varieties are formulated specifically for relaxation. Don't just assume that a tisane has no caffeine simply because it's herbal. Some herbs, such as yerba mate, actually contain just as much caffeine as a tea leaf, or even more sometimes. Some tisanes are imbibed for a specific purpose. Dandelion tea is an effective diuretic, and kava tea is used to help relieve stress. Many tea companies develop formulations that combine herbs to promote bowel movements, relieve PMS symptoms, reduce or prevent digestive discomfort, reduce fevers, and stop vomiting. Some tisanes can also be cooled and used topically as astringents and disinfectants. See an experienced herbalist to determine which tisane is right for your condition. Don't attempt to self-treat, as some herbal combinations can either cancel each other out or combine to be too strong. Tisanes also offer variety to the casual tea drinker. Herbal tisane flavors can range from light and bitter to deep and earthy, and even medicinal herbs can be consumed casually in weaker brews. Fruit tisanes are very common, and they are frequently made with blueberries, blackberries, raspberries and apples, all of which provide the characteristic flavor of the fruit. Flower tisanes are slightly less common, except for the ever-popular chamomile, and usually impart a light, delicate flavor. Tisanes of all varieties are also frequently mixed with true tea to create different flavor profiles. Chai tea, for example, is black tea mixed with a tisane made from spices. As versatile as tisanes can be, don't just pick a plant from your back yard and stick it in hot water. Some herbs are contraindicated for certain medical conditions, and others can interact negatively with medications. For example, if you are pregnant, you should not drink herbal tea without your doctor's consent because some herbs can stimulate uterine contractions. Kava tea is another example. It is used as a relaxation tea, but it has been shown to cause liver damage in some people after prolonged use.